I am a professional artist. I have been selling my work on a full time basis since 2003. I was born in South Wales UK and raised by my creative family, firstly in the historic roman town of Caerleon, then for a few years on the beautiful West Wales coastal town New Quay, my family finally settling in the beautiful 'Towy valley' in Llandeilo. My home life was idillic, an old farm in the middle of beautiful country side with freedom to play outside all day with my younger sister Laura. These early days have influenced my work immensely. I am Passionate about painting. I love exploring the endless possibilities of harmony between shape, colour and texture. I am part trained and self taught. Painting will be a continuous life journey in my life. I am a dedicated and prolific painter. I work everyday at my studio in my home in south Wales, UK, about 30 minutes from Cardiff. 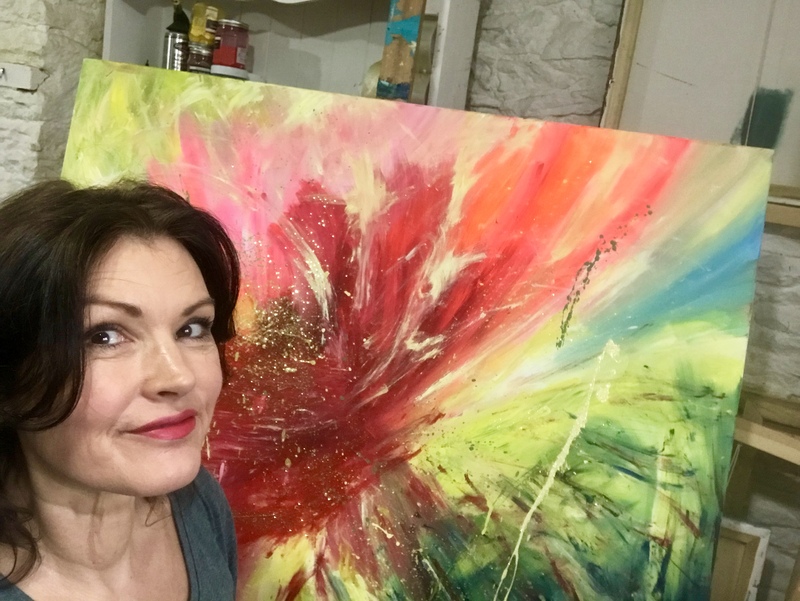 Born of a business, musical and creative family the door was open for me to explore my passion with paint. At the moment I am using mainly acrylic paint, it's fast drying qualities are perfect for the highly textured layered work that I create. My work is bold and bursts with colour. You can find my work in galleries and in private and public collections both home and abroad. Is it bold? clear? fresh? Does it 'pop?' are questions I ask myself at the end of a painting, if the answer is yes then the painting is finished. I have work all over the world including America, Nepal, France, Ireland, New Zealand, Canada, Australia to name a few. I have also worked considerably with corporate companies, producing original artwork for the workplace. An example of this is Motor Novo Finance, a hugely successful expanding business in Cardiff where I produced over 30 large paintings for board rooms/manager offices /reception areas. I have featured on local T.V and have also had work featured in various magazines such as 25 beautiful homes and Cardiff Life. Although a professional artist since 2003 I have been selling my work for around 20 years. This website has been professionally made by Duckfeet I have collaborated with my friend from school, Andrea Mainwaring nee Davies and is a story of a journey of two school friends now in business for ourselves years later. Andrea and I studied art in school together and later partly in college. Andrea went on to study graphic design in university. That all was in the late 80's, here we are again, working together! I highly recommend her website skills.